This document is a technical summary of the Federal Highway Administration report, Safety Evaluation of Offset Improvements for Left-Turn Lanes (FHWA-HRT-09-035), which will be available online at http://www.tfhrc.gov/safety. The Federal Highway Administration (FHWA) organized 26 States to participate in the FHWA Low Cost Safety Improvements Pooled Fund Study as part of its strategic highway safety plan support effort. The purpose of the pooled fund study is to estimate the safety effectiveness for several of the unproven low-cost safety strategies identified in the National Cooperative Highway Research Program (NCHRP) Report 500 Series. One of the strategies chosen to be evaluated for this study is offset improvements for left-turn lanes at signalized intersections. This strategy is intended to reduce the frequency of crashes by providing better visibility for drivers that are turning left. The safety effectiveness of this strategy has not been thoroughly documented, and this study is an attempt to provide a crash-based evaluation through scientifically rigorous procedures. The typical geometry and operation of signalized intersections can present several challenges. Sight distance is important for drivers to identify acceptable gaps in opposing traffic. Opposing left-turn lanes are typically aligned directly across from one another and immediately adjacent to the through lanes, as shown in figure 1(b). Thus, a left-turning vehicle in the left-turn lane can obstruct the view of oncoming vehicles, particularly those in the opposite left-turn lane. To improve sight distance and safety for left-turning drivers at intersections, the use of offset left-turn lanes has been recommended, as discussed in the NCHRP Report 500 Series Volume 12, "A Guide for Reducing Collisions at Signalized Intersections. "(2) Sight distance for left-turning vehicles is diminished by creating a negative offset (figure 1(a)). It can be improved by shifting left-turn lanes that are currently aligned with no offset (figure 1(b)) to the left to create a positive offset, as shown in figure 1(c). While the literature supports the use of offset left-turn lanes, there have been no rigorous evaluations of the safety effectiveness of this strategy. An investigation is needed to thoroughly evaluate the effectiveness of offset improvements for left-turn lanes in reducing crash frequency and severity at signalized intersections. 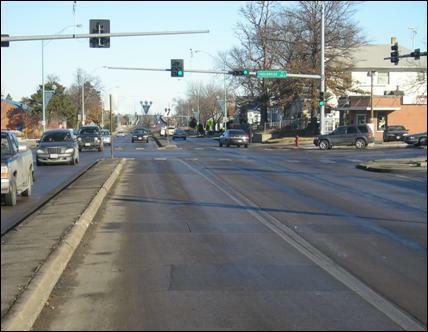 The safety effectiveness of offset improvements for left-turn lanes is explored empirically in this study to provide better support to the States when selecting safety improvements at signalized intersections. Data were collected from several States that have implemented offset improvements for left-turn lanes at signalized intersections. Study locations were selected from Florida, Nebraska, and Wisconsin based on the availability of installation data, including location and installation dates. Geometric, traffic, and crash data were obtained for a total before period sample of 851.6 site-years (120.6 from Florida, 644 from Nebraska, and 87 from Wisconsin) and 473.8 site-years in the after period (72.8 from Florida, 368 from Nebraska, and 33 from Wisconsin). Site-years are the number of intersections where the strategy is applied multiplied by the number of years the strategy has been in place at each intersection. For example, if a strategy is applied at nine intersections and is in place for 3 years at all nine intersections, there are a total of 27 site-years available for the study. Geometric, traffic, and crash data were also obtained for reference intersections with characteristics similar to the strategy sites in all three Sates but without offset improvements for left-turn lanes. Type 1 — Positive offset: The left-turn lanes are shifted to the left to enhance sight distance for opposing left-turn drivers (figure 2). Type 2 — Lateral separation with no offset: The left-turn lanes are separated from the adjacent through lanes, but opposing left-turn lanes are directly aligned with no offset or a very slight positive offset (figure 3). Type 3 — Lateral separation with a negative offset: The left-turn lanes are separated from the adjacent through lanes, but opposing left-turn lanes are still negatively offset, although less negatively offset than in the before period (figure 4). Figure 4. Example of a type 3 installation in Lincoln, NE (lateral separation with negative offset). Safety performance functions (SPFs) were calibrated separately for each State for use in the EB methodology. Generalized linear modeling (GLM) was used to estimate the model coefficients using the software package SAS®. (6) A negative binomial error distribution was assumed for the GLM, which was consistent with the state of research in developing these models. Total intersection-related crashes (within 76.25 m (250 ft) of the target intersection). Injury crashes (fatal plus all injury crashes). The full report includes a detailed explanation of the methodology, including a description of how the estimate of percent reduction was calculated. Two sets of results were calculated and are presented in the following sections. One set contains aggregate results for each of the three States. The other is based on a disaggregate analysis of the Nebraska sites, grouping sites by various characteristics to evaluate the impact of these variables on the safety effectiveness. A disaggregate analysis was not conducted for Florida or Wisconsin because of the small sample sizes. The aggregate results are shown in table 1 for Florida, Nebraska, and Wisconsin. Table 1. Results for Florida, Nebraska, and Wisconsin strategy sites. Note: A negative sign (-) indicates an increase in crashes. Bold denotes those safety effects that are significant at the 95-percent confidence level. 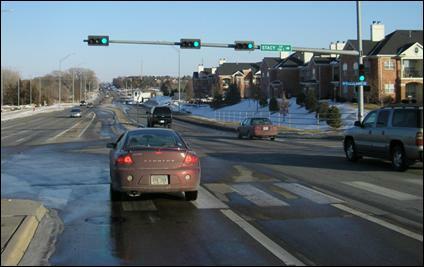 Unlike Nebraska and Florida, left-turn opposing crashes could not be precisely identified in Wisconsin; thus, the analysis includes all non-rear-end crashes involving a left-turning vehicle. For Nebraska and Florida, the results show little or no evidence that this strategy is effective overall (i.e., for total crashes). Installations in these States were mostly type 2 or type 3 (negative offset improved to no offset or less negative offset). For left-turn opposing crashes, a reduction in crashes was shown in Florida although the reduction was not significant. The opposite, a highly significant increase in left-turn opposing crashes, was found in Nebraska. For rear-end crashes, there was a small and insignificant increase in Florida. In Nebraska, rear-end crashes increased slightly, and this increase was statistically significant. In Wisconsin, where the analysis focused on crashes involving mainline vehicles only and where the installations were predominantly type 1 (negative or no offset improved to positive offset), the results indicate substantial and highly significant crash reductions in all categories — total, injury, left-turn, and rear-end. Combined effects for the three States were not estimated because the treatments and their effects varied significantly among the jurisdictions. Results from the individual State analyses generally indicated a greater safety benefit for the more enhanced offset improvements (i.e., creating significant positive offsets), as was the case in Wisconsin. For Florida and Nebraska, which included primarily type 2 and type 3 installations, the safety effects were negligible for total crashes. The disaggregate analysis is presented in the following section, indicating specific situations where the strategy may be more effective. A disaggregate analysis was completed for Nebraska, the only State with a sufficient sample size to facilitate this analysis. The disaggregate analysis attempted to discern factors that may impact the safety effectiveness of offset improvements for left-turn lanes at signalized intersections. The results of the disaggregate analysis are summarized below. The most obvious variable to examine in the disaggregate analysis was the type of offset improvement (i.e., type 1, type 2, or type 3). However, the effects by group were neither statistically significant nor statistically different from each other. The expected crash frequency prior to improvement was found to be most related to the safety effectiveness. Analysis revealed that the safety effectiveness increased as the expected number of crashes increased. For example, the 30 sites in Nebraska with 9 or more expected crashes per year in the before period had an 8-percent reduction in crashes compared to an insignificant 0.5-percent increase in crashes for all 92 Nebraska locations. This finding seems logical in that safety treatments are generally expected to be most effective where a safety problem is manifested in a high frequency of crashes. There are advantages and disadvantages to applying the results from the disaggregate analysis. The disaggregate analysis can shed light on specific conditions for which strategies may be most effective; however, disaggregate analyses are, by nature, based on smaller sample sizes than aggregate analyses. Smaller samples lead to larger confidence intervals and less precise results. A general rule cannot be applied for using either the aggregate or disaggregate analysis, but the decision of which analysis to use should be based on a case-by-case basis. Comparing the aggregate analyses among the three States, results generally indicate that safety benefits increase as the offset improvements increase (i.e., results appear more promising for type 1 than type 3). The disaggregate analysis indicates specific conditions that should be given priority due to the relative effectiveness of this strategy (i.e., where there are nine or more expected crashes per year in the period before installation). The purpose of the economic analysis was to evaluate the economic feasibility of offset improvements for left-turn lanes at signalized intersections. The economic analysis was accomplished by estimating the life-cycle cost of the strategy and the discounted annual cost of the strategy. Crash cost savings were estimated from the most recent FHWA unit crash cost data. (7) The annual crash reductions necessary to offset the cost were estimated by comparing the cost of the strategy to the crash costs. Wisconsin was the only State for which a safety benefit was detected overall and for which a benefit-cost ratio could be estimated. Wisconsin installations were almost all of the type 1 variety involving major reconstruction with capital costs that averaged $315,873 and an estimated service life of 20 years. Assuming a discount rate of 2.8 percent for a 20-year service life as suggested by the Office of Management and Budget (OMB), this translates into an annualized cost of $20,840. (8) The results in table 1 suggest a reduction of 2.39 total crashes per site-year. Using the lower comprehensive crash cost ($15,788) as a conservative estimate of the benefit, the annual savings due to the reduced crashes is $37,733. This conservative value compares favorably to the annualized installation cost of $20,840, giving (conservatively) a benefit-cost ratio of approximately 2:1. The disaggregate analysis for Nebraska showed that the strategy may be effective if implemented at sites with high crash frequencies. Based on the disaggregate results, it is possible to estimate crash frequency levels for which implementation of the strategy would be economically justified. Restriping costs, similar to those in Nebraska, are minimal. To provide conservative estimates, the more expensive type 2 and type 3 treatments, similar to those in Florida, were used in the cost estimate. Based on a discount rate of 2.7 percent as suggested by OMB, for a 10- to 15-year service life, the annualized cost is $5,067, assuming that four approaches are reconstructed. (8) The cost requires an annual crash savings of $10,134 to justify an installation based on a 2:1 benefit-cost ratio. The required crash savings as a dollar value were converted into crash frequency using the recent FHWA comprehensive crash cost estimates. (7) Again, using the lower crash cost ($15,788) as a conservative estimate, the annual crash reduction needed to justify the installation cost is 0.64 crashes per year (i.e., a 2:1 benefit-cost ratio is calculated as $10,134 divided by $15,788 equals 0.64 crashes per year). The disaggregate analysis indicates that the crash benefits increased as the expected number of crashes increased. The required crash benefit of 0.64 crashes per year could be achieved at intersections with nine or more expected crashes per year. Thus, the installation of the type 2 and type 3 varieties of this strategy through reconstruction similar to the Florida installations appears to be cost-effective at intersections with at least nine expected crashes per year and where left-turn lanes are justified by traffic volume warrants. Even with the conservative assumptions made, a very modest reduction in crashes is required to justify this strategy economically. Based on the results of this study, it appears that type 1 improvements (i.e., providing positive offsets) are cost-effective, even when major reconstruction is involved similar to the installations in Wisconsin. The type 2 and type 3 installations appear to be less effective than providing a significant positive offset. However, these types of installations are still justified as a safety treatment for intersections with nine or more expected crashes per year in the period before installation. The objective of this study was to evaluate the safety effectiveness of offset improvements for left-turn lanes at signalized intersections, as measured by crash frequency within 76.25 m (250 ft) of the intersection. The study examined the effects of this strategy on specific crash types, including total, injury, rear-end, and sideswipe crashes, in a rigorous crash-based analysis. The evaluation was based on 92 installations in Nebraska, 13 in Florida, and 12 in Wisconsin. The offset improvements varied greatly in the three States and, as such, the results were not aggregated. Many of the installations in Florida and Nebraska did not result in positive offsets. 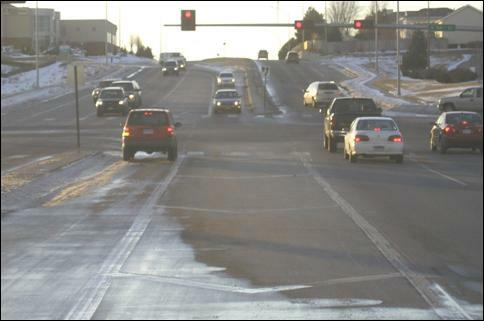 Nebraska installations mostly involved a simple modification of an existing left-turn bay for which the striping was reconfigured to narrow the existing left-turn lane and shift left-turn vehicles further to the left. The Florida installations were similar in principle, but they were somewhat more elaborate in that they involved shifting the left-turn lanes further into the median (on divided highways). However, the end results in Florida and Nebraska were often less negative offsets or no offsets rather than positive offsets. Wisconsin installations involved major reconstruction to improve the offset, and all but two were conversions from negative or no offset to a significant positive offset. From a practical standpoint, results presented in table 2 support the conclusion that offset improvements for left-turn lanes have the potential to reduce total and target crashes. This conclusion is based on the installations in Wisconsin, which resemble the strategy identified in the NCHRP Report 500 Series Volume 12 more closely than the sites in Florida and Nebraska. (2) The aggregate results for Florida and Nebraska show little or no evidence to suggest that this strategy is effective for reducing total crashes. However, the large variation in installation methods in the three States may explain the large difference in observed effects. Table 2. Summary of crash reduction factors. Note: Crashes in Wisconsin were identified as mainline crashes only. Left-turn crashes were defined as all non-rear-end crashes involving a left-turning vehicle. The disaggregate analysis provided further insight into the circumstances where offset improvements for left-turn lanes may be more effective. Based on the disaggregate analysis of Nebraska installations, the percentage reduction in crashes increased as the expected number of crashes increased. Specifically, the 30 sites in Nebraska with an expected frequency of 9 or more crashes per year in the before period had an 8.0-percent reduction in crashes (significant at the 5.0-percent level) compared to an insignificant 0.5-percent increase in total crashes for all 92 Nebraska locations. The general conclusion from this research is that offset improvements for left-turn lanes that result in a positive offset have the potential to reduce crashes and crash severity at signalized intersections. Based on the installations in Wisconsin, the results indicate substantial and highly significant crash reductions in all categories — total (34 percent), injury (36 percent), left-turn (38 percent), and rear-end (32 percent). While the aggregate results for Florida and Nebraska show little or no evidence that would suggest that this strategy is effective for reducing total crashes, many of the installations in these two States did not result in a positive offset. The disaggregate analysis indicated that the percent reduction in crashes tended to increase as the expected number of crashes increased. As such, type 2 or type 3 installations, similar to those in Florida, were cost-effective at intersections with at least nine expected crashes per year before treatment. Type 1 installations, similar to those in Wisconsin, resulted in a conservative benefit-cost ratio of approximately 2:1. Needless to say, the provision of left-turn lanes should be justified by traffic volume warrants. Given the potential to reduce crashes, the use of offset improvements for left-turn lanes is justified as a safety improvement, particularly at intersections with nine or more expected crashes per year. American Association of State Highway and Transportation Officials (AASHTO). (2004). A Policy on Geometric Design of Highways and Streets. 5th ed. Washington, DC. Federal Highway Administration. (2003). The Manual on Uniform Traffic Control Devices. Washington, DC. Federal Register. (2008). Notice of Public Hearing, Federal Register, Vol. 73, No. 20. Obtained from: https://www.whitehouse.gov/omb/fedreg/2008/013008_discountrate.pdf. Site last accessed June 25, 2008. Researchers — This study was performed by Bhagwant Persuad and Craig Lyon of Persaud Lyon, Inc. with support from Kimberly Eccles and Frank Gross of Vanasse Hangen Brustlin, Inc. For more information about this research, contact Roya Amjadi, FHWA Project Manager, HRDS by phone at (202) 493-3383 or through email at roya.amjadi@dot.gov. Distribution — This TechBrief is being distributed according to a standard distribution. Direct distribution is being made to the Divisions and Resource Center. Availability — The TechBrief may be obtained from the FHWA Product Distribution Center by email to report.center@dot.gov, fax to (814) 239-2156, phone to (814) 239-1160, or online at https://www.fhwa.dot.gov/research/tfhrc/programs/safety/index.cfm. Notice — This document is disseminated under the sponsorship of the U.S. Department of Transportation in the interest of information exchange. The U.S. Government assumes no liability for the use of the information contained in this document. The U.S. Government does not endorse products or manufacturers. Trademarks or manufacturers' names appear in this report only because they are considered essential to the objective of the document. Quality Assurance Statement — The Federal Highway Administration (FHWA) provides high-quality information to serve the Government, industry, and public in a manner that promotes public understanding. Standards and policies are used to ensure and maximize the quality, objectivity, utility, and integrity of its information. FHWA periodically reviews quality issues and adjusts its programs and processes to ensure continuous quality improvement.